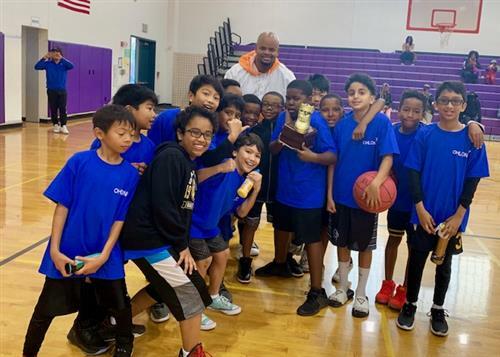 March Madness, college basketball’s annual championship tournament, came early for several elementary schools in the West Contra Costa Unified School District. Coronado Elementary School is located in an urban community. There are many single-family homes, with a mixture of duplex/quadruplex houses and apartment buildings, including a housing project. Outside the school’s attendance area, but easily accessible, are institutions that are used to enhance cultural and educational opportunities such as Richmond Arts Center, the Richmond Public Library, civic offices, the offices of the mayor and other elected officials, and the East Bay Center For the Performing Arts. Directly across the street from the school is the Coronado YMCA. We believe that public education provides the opportunities and experiences that enrich us all and is essential to the future and success of our community. Provide safe and nurturing environment in which to learn, teach, work and participate. Serve our students by working as partners with our community to develop well-rounded lifelong learners and contributing members of a global society. Take responsibility for our behavior and performance to ensure the highest possible achievement of all students, employees and our school community. Provide equitable and essential communications and support for successful learning, teaching, working and participating. Respect, celebrate and welcome diversity, uniqueness and contributions of all members of our school community.